Set out on a grand adventure in this turn-based, retro style, pixel-art RPG, inspired by the great titles of the 90's. Take on the roles of in-game players taking on the roles of their characters in a traditional pen and paper RPG session in the ultimate meta roleplaying experience. As both the playing characters AND the game master, players can choose which battles to fight. Put together a bunch of monsters to make for a challenging fight and your efforts will be equally rewarded! Choose from multiple classes, such as knights and mages, pick your characters to control those classes, like grandma or kid brother, and take on the loads of quests, monsters, items and equipment littered throughout Knights of Pen & Paper +1 Deluxier Edition. Blacksmiths, enchanters, mining, gathering, hidden treasures and a whole lot more await, giving players a lot of room to personalize their gameplay experience. Don’t wait any longer, the Pen & Paper world needs you! Knights of Pen and Paper +1 Deluxier Edition was released on Xbox One 323d ago in the US and the UK. 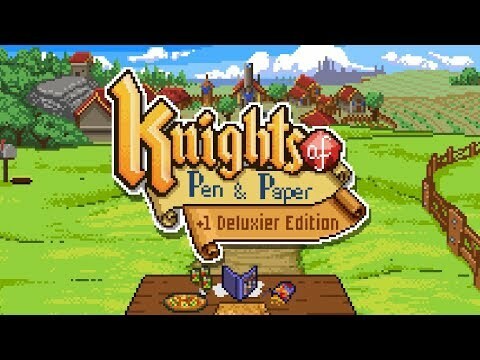 Notify me when Knights of Pen and Paper +1 Deluxier Edition is available.